The Constant Contact integration allows you to create a new Constant Contact subscriber from a Blitzen form. Note that you have to have a Constant Contact Account to use this integration. Navigate to the ‘Integrations’ section in the left-side panel and click on the ‘Constant Contact’ app. Choose a form or survey to work from (How to Choose an Input). 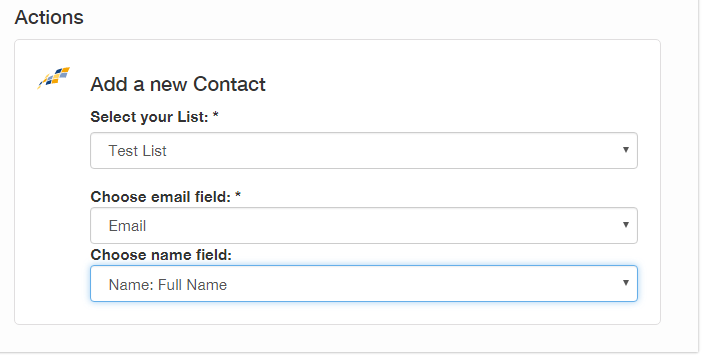 The only type of form you can use the Constant Contact App with is one that contains the ‘Email’ field. It is also strongly recommended that the form you use contains a 'Name' field. This will make personalizing your emails easier. Drag the Constant Contact App over into your workflow. You can configure the app by clicking the ‘+’ icon. Use the drop-down menus to select the list you wish to add your subscribers to as well as their contact information (email and name fields).